Get your taste buds ready for an explosion of yumminess! That’s probably not even a word, but that’s o.k. It’s good Old Fashioned Homemade Pot Pie. Not from the freezer section of the grocery store. It’s not difficult, I promise. It’s flaky delicious . . . and fattening. You can run it off later. Trust me, it’s worth every calorie. and of course . . . I made Dessert! Come back tomorrow for that recipe. Follow me into the kitchen . . . and let’s get busy. This recipe is my all-time favorite Pastry for pies, etc. This is the 1st time I ever used a food processor to make my pie crust . . . honest! If you don’t have it . . . I promise, you don’t need it. *I explain in the recipe below – how I usually make Pastry. That machine makes the process very FAST . . . I just about cut my fingers off! I like to cut the shortening into small pieces. My Food processor has a pulse button . . . pulse. pulse. pulse . . . just until the mixture is in large size clumps. Very Gently Pulse, if you want FLAKY CRUST. In a small bowl mix the following together, until well blended. I just use a fork. Add the liquid to the flour/shortening mixture. Cover and Pulse. Pulse. Pulse. GENTLY . . . and use only as many pulses as needed . . . When it starts to pull away from the edges of the bowl, STOP PULSING! Take the lid off, and with a spatula, begin to Press the dough together. Don’t use you hands…..the blade at the bottom is very SHARP! I like to split the pastry dough in half like this. Chill the dough, while you prepare the inside of the pot pie. I have left-over Chicken Breasts that I’m using. Use Rotisserie chicken, chicken breasts or turkey is also good. You will need about 2 cups of cut up cooked chicken. I have frozen peas from last years garden. You could also buy a 10 ounce bag of your favorite frozen veggies. This is a fast easy way to cook carrots – etc. Don’t over cook them….you just want them crisp tender. They will cook more in the oven as the pot pie bakes. I’m also planning to add 1 cup of grated cheddar cheese to my sauce. if the sauce is a bit too thick for your liking. Let’s make the sauce . . .
Start by making a roux. Stir continuously . . . while the sauce thickens, over medium heat. 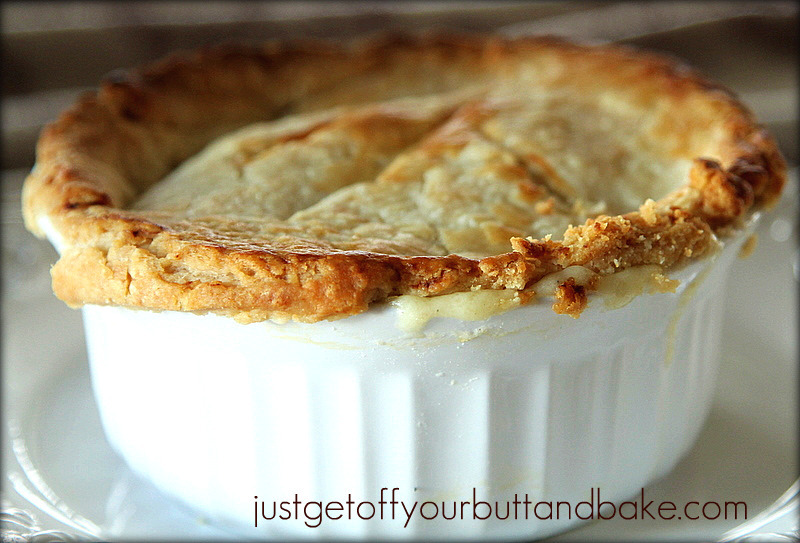 I like to make my pot pie a bit more fattening . . . This is an optional option! When the sauce is ready, turn the heat to very low, and slowly add the cheese. Don’t let the sauce boil. I’m making individual pot pies . . . 2 for now and 2 for the freezer. You can also make a 9x9x2 inch square pan instead. If you need to make a 9×13 – Double the ingredients for the sauce. A single Pastry recipe will be plenty for a larger size dish. Cover with saran wrap, and ROLL THE PASTRY OUT. I divided each disk of pastry dough in half again. Use a plate or a bowl, that is a bit larger than your ramekins. Roll and cut your pastry to fit your dish – leaving at least 1/2″ of pastry hanging over the sides. I’m making rustic looking pot pies. It’s fast and easy. Don’t worry about the edges being perfect. in a pre heated 400 degree oven for at least 40 minutes. until the Pastry is Golden and yummy looking. If the pastry edges start to get too brown, cup strips of foil and wrap around the edges only. I really didn’t have time to take decent pic’s. When they came out of the oven . . . my hubbie was NOT WAITING! So this is what you get! 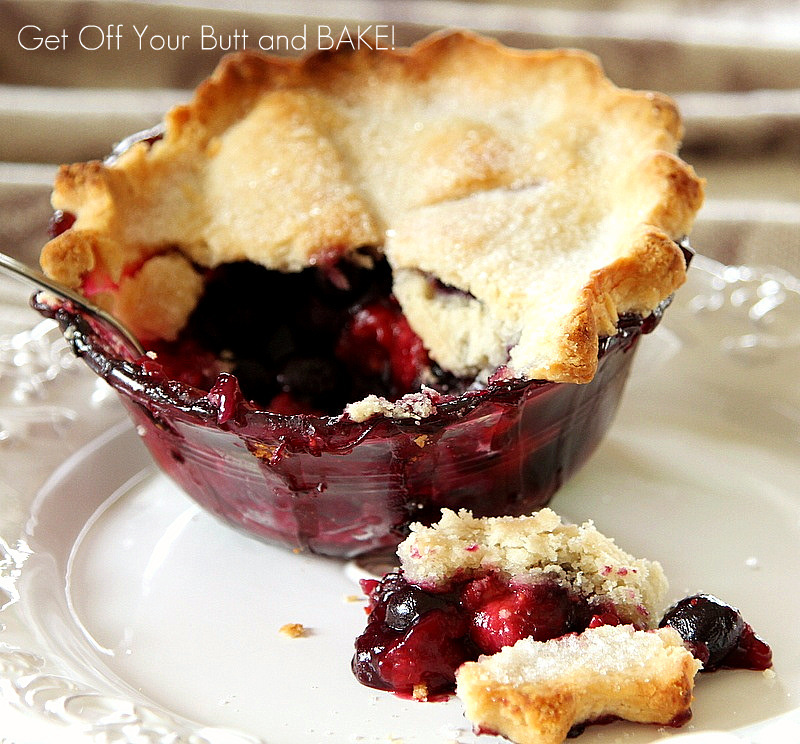 I also made these mini Blueberry Raspberry Pies with the rest of the pastry. Come back tomorrow for that recipe and tutorial. I made the edges a bit prettier . . . but RUSTIC tastes the same. Excuse me now . . . I have a lot of running to do! Sift flour, sugar & salt together. Put dry mixture into a very large Tupperware bowl, with a firm fitting lid. Cut shortening into smaller pieces, with either a fork, or a pastry cutter. Make sure that the shortening has been tossed around a bit in the flour. Now put the lid on your tupperware bowl, and shake, shake, shake, until it has become the size of small peas. In another small bowl, combine the egg and the vinegar, and mix together with a fork. Now pour that on top of your flour mixture. Grab a fork, and simply toss some of the flour over the top of the liquid, covering as much liquid as you can. DON’T STIR OR TRY TO MOLD THE DOUGH! Put the lid on the bowl, and begin to shake, shake, shake! ….until it has started to adhere together. Peek at the dough…..if it is still quite sticky, toss a little more flour over the dough. (1 -2 tablespoons). Replace the lid, and shake again. You will know when the pastry is ready, because it will form a ball of dough……all on it’s own. It’s like magic…and will always give you perfect, flaky crust. I promise. If using a Food processor, gently pulse until barely blended. Don’t over Pulse. *This recipe makes 2 double crust 9″ pies. Heat butter over low heat until melted. Blend in the flour, onion powder, sugar, salt and pepper. Cook over low heat, stirring constantly, until the mixture is smooth and bubbly; remove from heat. Stir in broth and milk. Heat to boiling, stirring constantly. Boil and stir 1 minute. Stir in chicken and frozen vegetables. Now you can either use a square 9×9.2 pan, or a pie pan. Ease your pastry into pan. Pour chicken filling into pastry lined pan. Roll remaining dough , and place over filling. Flute edges. Cut slits in center to allow steam to escape. Cook on middle rack, uncovered at 425 degrees oven until crust is brown. 40-50 minutes. Make sure that the bottom crust is very done. You can also do this without a bottom crust. Just put your pastry over the top of the filling is you would like. 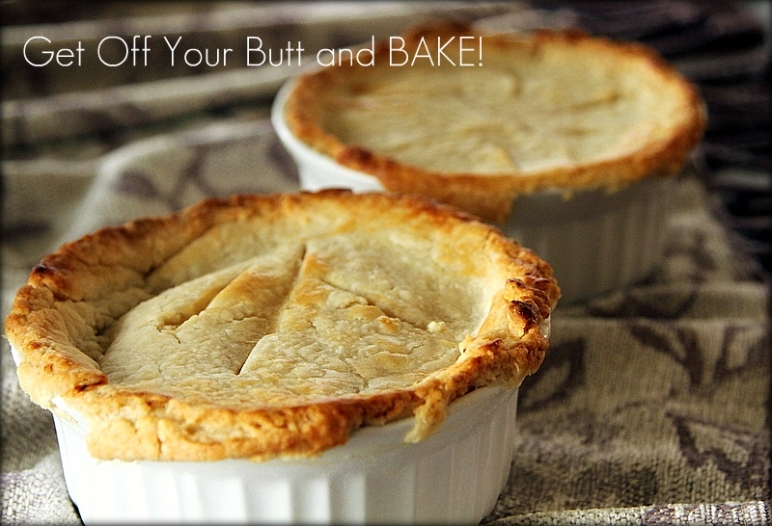 You can also make individual pot pies in deep pastry cups. Double the filling for the pot-pie . . . recipe above, if you would like to make a 9×13 inch glass pan. We have the exact same pie crust recipe! It is THE BEST ever! I’ve cheated and made pot pie with canned biscuits and my kids hated it. I should have known they wouldn’t like it as they aren’t crazy about those biscuits. I need to give your recipe a try.